The Everpure Helia Victorian Series Faucet for the Helia Chiller/Instant-Hot drinking water appliance, delivers chilled and hot filtered water from a single spout. Exclusively designed to be used with the Helia Home & Office Water Chiller/Instant-Hot to perfectly compliment today’s kitchens. Note: The Exubera & Helia products can not be sold in California. 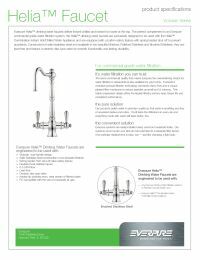 Consumer Alert: The manufacturer's "Step By Step Install & Setup Guide" depicts the black tube of the Helia faucet as the hot tube, and natural tube as the chilled tube. In fact, this is reversed. The natural, or clear tube is the hot tube. 3 years on the finish and 5 years for workmanship defects.